Many people have moles on their bodies. It may be difficult for you to tell the difference between a common mole and a concerning mole. Dysplastic nevi are atypical moles that have a greater chance of becoming skin cancer. The medical term “nevi” is the plural form of “nevus”, and a nevus is another name for a mole. Find out about the difference between common moles and dysplastic nevi. A common mole, also called a common nevus, is a growth on the skin that develops when pigment cells (melanocytes) grow in clusters. Most adults have between 10 and 40 common moles. These growths usually occur on areas exposed to the sun. They are rarely found on the scalp, breast, or buttocks. Sometimes, common moles are present at birth, but they usually appear later in childhood. Most people continue to develop new moles until about age 40. In older people, common moles tend to fade away. A dysplastic nevus is a type of mole that looks different from a common mole. Some doctors will use the term “atypical mole” to refer to a dysplastic nevus. These nevi (the plural form of nevus) may be bigger than a common mole. A dysplastic nevus’s color, surface, and border may all be different, and it is usually more than 5 millimeters wide. A dysplastic nevus can have a mixture of several colors, ranging from pink to dark brown. It usually is flat with a smooth, slightly scaly, or pebbly surface. These atypical moles have irregular edges that may fade into the surrounding skin. 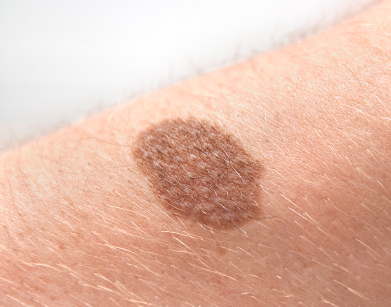 A dysplastic nevus may occur anywhere on the body, but are usually found in areas exposed to the sun. They may also appear in areas not exposed to the sun, such as the scalp, breasts, and areas below the waist. Usually, people who have dysplastic nevi also have an increased number of common moles. What should I do if I have dysplastic nevi? Common moles, dysplastic nevi, and melanoma vary by size, color, shape, and surface texture. Another important difference is that a common mole or dysplastic nevus will not return after it is removed by a full excisional biopsy from the skin, whereas melanoma sometimes grows back. Also, melanoma can spread to other parts of the body. The list below summarizes some differences between moles and cancer. How many people have common moles? Most American adults—about 300 million people—have common moles. How big are they? Usually less than 5 millimeters wide, or about 1/4 of an inch (not as wide as a new pencil eraser). What color are they? Can be pink, tan, brown, black (in dark skin), or the person’s normal skin tone, and color is usually even. What shape are they? Usually round or oval, and has a distinct edge that separates it from the rest of the skin. What is the surface texture? Begins as a flat, smooth spot on the skin, and may become raised and form a smooth bump. How many people have dysplastic nevi? About 1 in 10 American adults—about 30 million people—have at least one of these. What color are they? May be a mixture of tan, brown, red or pink shades. What shape are they? Have irregular or notched edges, and may fade into the rest of the skin. What is the surface texture? May have a smooth, slightly scaly, surface, or a rough, irregular and pebbly appearance.